Thyroid problems affect millions of Filipinos yet over half are presumed to be unaware of their thyroid dysfunction as symptoms of thyroid disorders are often mistaken for other diseases. Thyroid symptoms are sometimes hard to catch, and so these are often ignored by patients. According to a study by the Philippine Society of Endocrinology, Diabetes and Metabolism in 2012, one in 11 Filipino adults has goiter, and around one in 12 Filipino adults suffers from some form of thyroid disorders. The thyroid gland is a major regulating player in the body's metabolism. It plays an important role as the master control center for every cell's metabolic functions. Because there's such a wide range of problems, thyroid conditions are tricky to diagnose. Thyroid disorders often progress for a long time with no treatment in some cases. Hence, it is important to have one’s thyroid checked as early as possible. 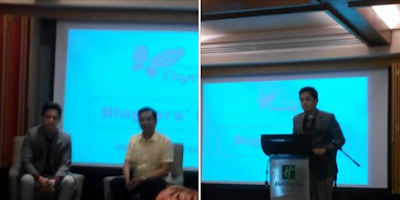 Merck Inc. held a bloggers event last September 21, 2016 at the Holiday Inn Makati to raise awareness on thyroid disorder. 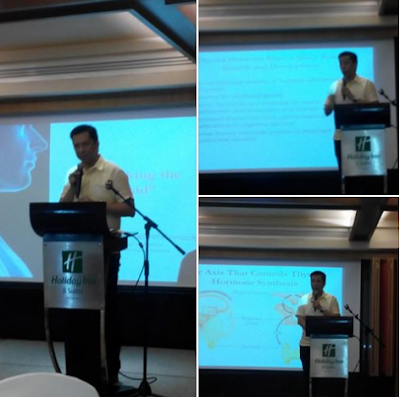 Dr. Nemencio Nicodemus, Jr., President of the Philippine Society of Endocrinology, Diabetes, and Metabolism, gave an informative talk on what the thyroid is, as well as the symptoms of thyroid disease. He discussed the importance of early detection plus symptoms and facts about the Thyroid Disease including nodules, goiter and thyroid cancer. Dr. Nicodemus taught the audience how to do a simple self-exam to help find lumps or enlargements that may point to thyroid conditions. Patients with hypothyroidism, or too little thyroid hormone, tend to have slower metabolism. They gain weight despite not eating much, move and speak slowly, feel tired and have depressed thoughts, cannot tolerate cold, and have irregular menstrual periods. In extreme hypothyroidism, the life threatening Myxedema occurs. Myxedema slows the metabolism to a point where you would fall into a coma. On the other hand, patients with hyperthyroidism, or too much thyroid hormone, will have hyperactive metabolism. Symptoms closely aligned with hyperthyroidism are weight loss, rapid heartbeat, weakness, anxiety, trouble sleeping, have sweating and heat intolerance, and can have tremors in their hands. Hyperthyroidism causes the body to run on overdrive all the time. Hyperthyroidism, when left untreated can lead to serious heart complications like Arrhythmia, (abnormal heart beat), congestive heart failure (Cardiac Arrest) and Hypertension. Dr. Nicodemus stressed that proper information and early detection will always be better than cure that comes too late. More information can be found online in the website www.thyroid.ph. This is an online repository of information where people can learn more about thyroid disorders. The website also contains useful guides which can help people check themselves for symptoms of thyroid disorders, such as goiter, hyperthyroidism, or hypothyroidism.